Maximize your money. Be prepared for retirement. Create good, sustainable financial habits. You can accomplish all of this by laying out a strong financial foundation in your 20s. Since you’re likely just starting out, developing good money habits now will be a lot easier than trying to change bad habits later. 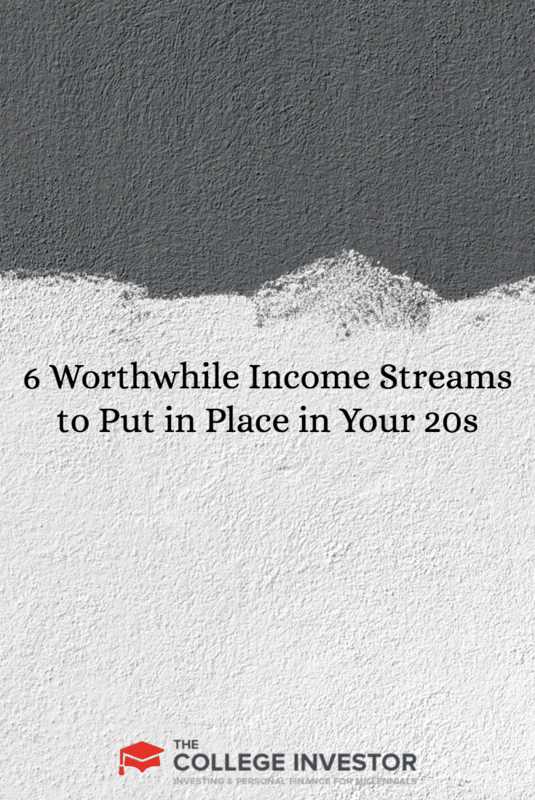 Here are six income streams that you can set up in your 20s that will benefit you for years to come. You know the advice: the earlier you start investing the less money you’ll have to save. It’s true — compound interest will work in your favor. It’s the premise behind the ultimate Guide to Saving for Retirement. When thinking about retirement, saving in your 20s is the way to go. You’ll not only have to stash away less money, but you’ll also develop lifelong money habits. Here are three common ways to save for retirement. When you first start saving for retirement, the easier the better. And, it can’t get much easier than putting money into your 401(k) plan at work. Set up an appointment with the financial adviser at work to discuss where your money should go. After you’ve picked investments to suit your needs, set up a percentage of your paycheck to be put into your 401(k) each pay period. If your company provides a match, make sure you’re contributing enough into your 401(k) to earn the full company match. If you’re like me and don’t have a 401(k) plan to contribute to, a Roth IRA is a great option. You can open up a Roth IRA with the help of a financial adviser, or if you’re comfortable doing so, you can open one up online by yourself. With a Roth IRA you have endless investment options. This means it’s important to do your research on what investments will coincide with your plans. The great thing about a Roth IRA is that you’re putting taxed dollars into the account. This means at retirement age you won’t be taxed on the money you withdraw. If you’re able to max out your 401(k) plan at work you can open up a Roth IRA as well. Don’t know where to get started? Watch this video: How to Open a Roth IRA at TD Ameritrade. If you’re having fun watching your money grow in your retirement accounts, you can add some dividend investing to the mix. Dividends are paid regularly to shareholders owning the dividend-paying company’s stock. Not all stocks pay dividends, but many big-name companies do. The greatest appeal of investing in dividends is that you receive a check, typically quarterly, and if you purchase enough dividend stocks you can supplement your income now and in retirement. Check out these 10 short-term investments for young investors. We’ve covered retirement, but obviously you have to first earn money before you can invest it. Here are three ways to earn money now, but keep in mind you have many options to increase your income. Choosing the right career is probably the single most important thing you can do right out of college. You want a career that you enjoy, but in addition to that you need to earn a salary high enough to support yourself. Other things to consider are a company’s retirement and benefit plans. Also, if you plan on staying with one company over the long-term, there needs to be opportunity for growth. Who says your income should only come from your day job? There are many young people who have turned their side businesses into huge, million-dollar businesses. This may not happen for you, but earning money on the side is never a bad thing. If you want to accelerate your saving, investing, and partake in a little splurging, a side hustle can help. A side hustle consists of anything you do outside your day job to earn extra money. The possibilities are limitless. I bought my first (and only) flip house when I was 23. I’ll admit: I got extremely lucky. I found a steal on a foreclosure and since there were multiple bids on it, I offered a couple hundred over the asking price and got the deal. The house was already nice with minimal repairs needed. I went in, painted a couple rooms, and put the house back on the market. Luckily, I sold the house very quickly and made an easy profit of around $9,000. I’ve kept my eye on houses in my area since then but haven’t come close to finding a great deal like I did the first time around. Real estate investing can be pretty risky. However, the rewards can also be huge. If you want to invest in real estate, whether that entails renting a property or flipping a house, start saving now. This way when that deal of a lifetime arises, you’ll be ready to jump on it. Check out these ways to invest in real estate online for just $5,000 or less. 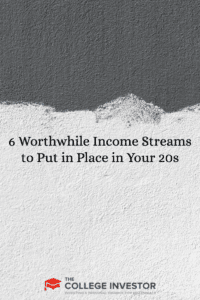 If you set up these six income sources in your 20s, they can help you start off on the right foot financially. The important thing is for you to choose what feels best to you and give it your all. Implementing good financial habits in your 20s can save you from a lifetime of worrying about money. What do you think? Would you add anything to the list? Still in college, but doing a lot of research on this topis. Good work.